The Twins are open for business. Right now, that business is to find a replacement manager for the reigning American League Manager of the Year, Paul Molitor. Minnesota under-performed in 2018 and the new front office is in search of someone that fits with the direction of the club. There are currently six open managerial positions (Angels, Orioles, Blue Jays, Rangers, and Reds), so the Twins will have competition for some of the top managerial candidates. Historically, Minnesota has turned to an internal candidate for the job (see Tom Kelly, Ron Gardenhire, Paul Molitor). That being said, here are a few of the internal names being tied to the club. Qualifications: He spent seven seasons as hitting coach under Joe Maddon in Tampa Bay. Also, he spent five seasons as hitting coach in Cleveland. He managed in the Yankees minor league system for multiple years. The 2018 season was his 14th season as a coach at the big-league level. Qualifications: This past season was his second season as a professional coach. His roles this season included instructing the outfielders, advising coaches and players on game preparation, and communicating with the player development side of the baseball operations department. He served as a scout with the Diamonbacks and Padres organization. He also served in a front office role with the Dodgers. Qualifications: He has coached professionally for 17 seasons. Had multiple tenures with the Yankees organization as their minor league hitting coordinator. He spent a couple seasons in the Cubs organization as their minor league hitting coordinator and big-league hitting coach. Minnesota has already interviewed him for the job. Qualifications: He spent six seasons managing in the Indians minor league system. He moved up to Cleveland’s big-league staff in 2000 and even served as the interim manager in 2002. At the time, he was the youngest manager in baseball. He remained on the coaching staff until 2009 and then moved on to become Oakland’s bench coach. This past season was his first in the Twins system. How do you view the internal candidates? Do any of them have a leg-up on the job? Leave a COMMENT and start the discussion. Of note... these are all "internal" candidates, but candidates brought in during the Falvine Administration. So hopefully we don't get any of that old complaining if it were to be any one of these candidates. Last season I felt like Pickler was the guy they had in mind to be “manager in waiting” Then the bench coach job opened up and they hired someone else for it making me wonder if that really was the case. Now we will find out who they really want as a manager. The fact that they haven’t started interviewing candidates from teams out of the playoffs suggest that either they feel strongly about internal people, that someone on a team still playing is of interest to them, or they are just takeing there time? While most of the open managerial positions are not super prime spots to start out (I believe they will hire someone with no prior major league managerial experience) there will be some competition for the top candidates and they better not take too much time. I really don't have problems with any of these guys. Both have spent plenty of time outside the org. I think I'd only promote one of these guys if the Twins were convinced they were going to leave for another managerial opening. Basically, if the only way to keep them in house is to make them manager, go ahead and do it. This is a desirable gig, there are only 30 of these jobs. Why not use the opening to try and attract somebody you'd never be able to get into the org otherwise? It's hard to know about these guys because we don't really hear that much about their day-to-day activities, and we have little way to evaluate them in light of what a manager must do. Rowson, for instance, is probably pretty buddy-buddy with his hitters, so it's nearly impossible to guess whether he'd have what it takes to crack the whip now and then in a role as manager. Perhaps either Shelton or Pickler has had the occasion to crack a whip, but we wouldn't have seen that, and it's always easier to operate as someone's #2 than to be the final authority. And of course managing isn't all whip-cracking; running a rotation and a bullpen involve listening and inferring, and playing-time decisions for position players can be subtle. All of this is nearly impossible to know until the guy is given the chance. It's like taking the training wheels off the bike - totally different experience. Running a AAA team could be harder in some ways than running the big club, since probably two thirds of the roster doesn't believe they belong there. OTOH many managerial decisions come down from on high. Skinner is experienced, but you can also call that being "a retread". He's kind of old by now, and after a certain point I figure that too many teams have considered him and passed, so I expect he gets passed over again. Too bad if circular logic gets in the way of a man's career aspirations, though. The ideal candidate is probably in his 40s. Both Pickler and Shelton qualify - Pickler is only 42 and maybe too green, Shelton is 48 and probably this is his chance, before he's viewed as "getting too old" as well. So Shelton stands out to me among these internal candidates, but it's based on shaky information. I think that it is Shelton's job to lose. The fact that he is a former catcher will help him with the pitcher/bullpen managment as well. 2 words....Alex Cora. Hire Alex Cora? Of course not. Hire a fiery manager like Alex Cora? They had better. No more milk toast managers. Last night with the Red Sox about to close out the Yankees, Cora showed more fire and animation than Molitor or Gardenhire did in a Twins' entire season.I don't think any of the mentioned candidates meet that criterion. Even TK really did not but he did have a kind of presence in the dugout. 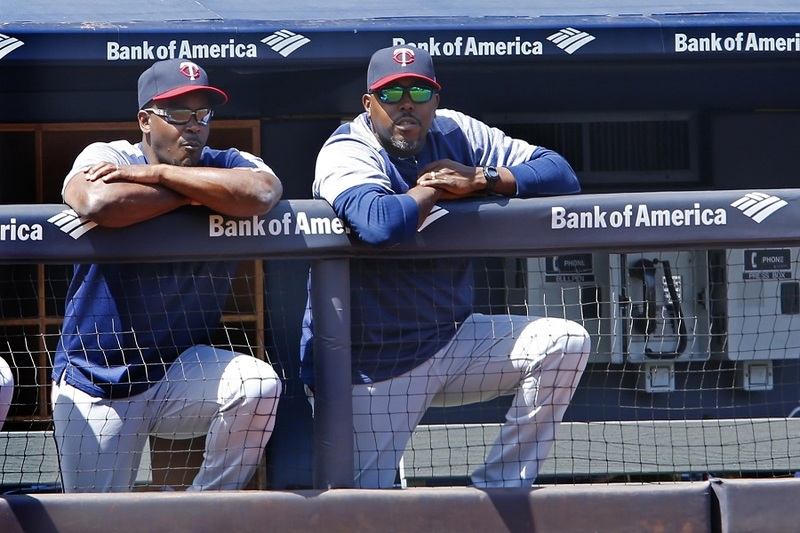 The Twins must hire a manager who assumes the role of the team personality that will rub off on the players over time. Anyone can fill out a lineup card. If you don't think Gardy "showed fire" you weren't paying attention.#8 all-time in ejections.Famous incident during the Angels playoff series when he went to the mound, signaled in a reliever, and then had Mientkiwicz say "Isn't Kyle Lohse on the team any more? "- went ballistic. Great article. Thank you. I would rank the Twins' vacancy as the second most desirable after Toronto. TO has a much larger budget and two of the top 10 prospects. I hate to ask, but are any of the candidates mentioned in the article fluent in Spanish? Nope. What did any of them contribute this year. Did they help or inform Molitor? Did they impact any players? I have to admit not knowing a great deal about these guys, so your article was very informative. That said, none of them do much to excite me.